As a confirmed lover of Old Hollywood and anything relating to it, The Artist seemed like a natural to me. And yet, I avoided it during its theatrical run - even after it nabbed a handful of Oscar awards. The film just came across as a too-cute and self-aware bauble. A bunch of French artistes making a silent movie? Pass. Now that The Artist has migrated to home video, the curious among us can finally see what the hype was all about. Personally, I can now safely say that my perceptions were wrong: this is an impressive film. Not an exact recreation of a silent-era film, perhaps, but a thoughtfully crafted and thoroughly joyous tribute to Hollywood and the movies -- past and present. No wonder the Academy (and everyone else, it seems) embraced it. The fact that The Artist hangs on a wisp of a plot serves as another one of those warning bells with this movie, but strangely enough the simplicity of its story ultimately works in its favor. 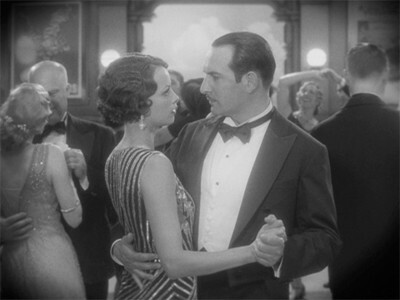 In an energetic performance, Jean Dujardin plays roguish, perpetually smiling movie star George Valentin, a Douglas Fairbanks type who is at the peak of his fame when the film opens in 1927 Hollywood. After the premiere of his latest flick, an action-packed mystery co-starring his faithful dog, George bumps into an admiring fan in a situation that turns from awkward to a golden photo opportunity. The lady in the fracas is Peppy Miller (Berenice Bejo), a lovely aspiring actress. The next day, Peppy uses the "Who's That Girl?" press coverage to wrangle her way into George's studio to audition as a dancing extra. Moving through the ranks at the studio, Peppy keeps a friendly rapport going with George (who applies a beauty mark to her cheek to make her stand out from the other chorines). The cataclysmic arrival of sound in movies heralds nothing but good for a talented ingenue like Poppy, but George laughs it off. As studio head Al Zimmer (John Goodman) preps Kinograph Studios to be a completely sound-equipped studio, George becomes marginalized and finally let go. This puts a strain on his already tenuous marriage. George's wife, Doris (Penelope Ann Miller) leaves, leaving behind the dog and George's faithful butler Clifton (James Cromwell). 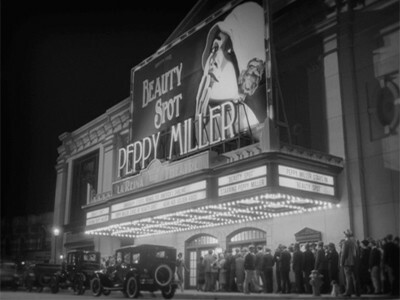 Meanwhile, Peppy becomes a sensation in escapist talkies like Beauty Spot. George sinks his savings into a self-produced silent starring vehicle, the adventure yarn Tears Of Love, which is an instant flop. Despite being a full-fledged movie star, Peppy still maintains a keen interest in the now-obsolete man who "discovered" her. Can she intervene in his downward spiral before it's too late? The Artist is an interesting case of émigrés outdoing Hollywood in telling a Hollywood story. What struck me the most about the film is its guileless lack of irony - it's completely, refreshingly sincere. The lack of dialogue, while gimmicky at first, ends up succeeding beautifully. Like the best of 1920s-era cinema, eventually you forget the fact that it's silent and get absorbed into the story, the nicely recreated period ambiance, and the spot-on cast of characters. This was filmed in and around Los Angeles, in well-preserved spots like the Bradbury Building which serve as the few remaining locales that have an early 20th century feel. The fact that they did this without any apparent CGI is really quite miraculous. Also notable are the historically accurate cars and props, dazzling costumes, and photography effects (wipes, blur around the edges) that instantly conjure up a vintage feel. The results are not so much a straightforward re-creation of silent movies as a dreamy, romanticized evocation of them. Although it's totally apparent that a lot of talents contributed to The Artist, overall it has a refreshingly insular feel that's a complete change from most U.S.-produced product. Director-screenwriter Michel Hazanavicius had already worked with Jean Dujardin and Berenice Bejo (his wife) on the enjoyable '60s spy sendup OSS 117: Nest Of Spies (2006), while Hazanavicius and Dujardin re-teamed for that film's sequel, OSS 117: Lost In Rio (2009). The three seem to have a great rhythm going with this one, resulting not only in an honest, affable interplay between the two leads but an overall relaxed feel with the entire production. Hazanavicius especially succeeded at getting terrific performances from the cast, with Dujardin and Bejo contributing turns that are the very definition of "charisma." With the actors conveying emotion through gestures instead of spoken dialogue, there's always the danger that it will look affected or artificial. The cast of The Artist generally avoids that. 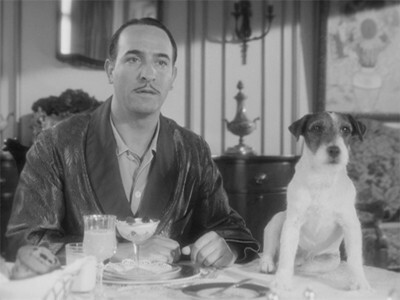 Dujardin is pretty astonishing, as a matter of fact - his comedic bit at the breakfast table (with an also-impressive Uggie, the dog) should be required viewing for acting students. Bejo, although not quite the physical embodiment of the early 1930s movie star (the beauty ideal back then was more of a round-faced, Constance Bennett type) is also utterly sweet and vivacious. I liked how Peppy wasn't spoiled by stardom, one of the several unexpected turns this film takes. Bejo also has a skilled bit of pantomime with George's coat, a clip which seems to have been shown everywhere by now. Is The Artist a perfect film? No. There are some under-explored angles to the story (I kept wondering why the wife hated George so much), and the period detail, while stunning, does have a few missteps (mostly relating to the typography, which relies too heavily on computer-age fonts). By and large, I found it a wonderfully sincere and loving tribute to the silent era. Not entirely silent, however - the way it uses sound effects and spoken dialogue is as unexpectedly charming as the rest of the film. Sony Pictures' DVD edition of The Artist presents the film in the historically accurate 4:3 black and white picture it was shot in. The picture quality on disc is beautifully mastered with rich layers of grey, deep blacks and sunny whites which don't overpower the agreeably balanced cinematography. One of the more enjoyable assets in this film came via the musical backdrop from Ludovic Bource, a diverse, evocative score that runs from playful to pensive. The clearly mixed stereo soundtrack on the DVD serves as an excellent showcase for it. Also provided on the disc are descriptive subtitles in English and Spanish. Various behind-the-scenes featurettes, presented in 16x9 widescreen, make up the bulk of fascinating bonus material on the DVD edition. First up is a brief Blooper Reel (2:14), which serves as further proof of the film's relaxed atmosphere. The Artist: The Making Of An American Romance (21:56) delves into the film's production in good, if not very penetrating, fashion. Q&A With The Filmmakers And Cast (44:55), a casual post-screening sit-down which finds the film's personnel in a relaxed (there's that word again), conversational mood. The piece, moderated by KCRW talk show host Matt Holzman, includes a few interesting revelations from Michel Hazanavicius, Jean Dujardin, Berenice Bejo, producer Thomas Langman, and actors James Cromwell and Missi Pyle (who plays a flapper-ish actress). Hollywood As Character: The Locations Of The Artist (5:10) details the L.A.-area filming locations used throughout the film. I so wish this was longer, but even in this compact form it's good. Finally, The Artisans Behind The Artist (11:30) is composed of four mini-featurettes which absorbingly go into the film's production design, cinematography, costumes, and scoring. These are all in color, by the way, which is interesting enough in itself since they include lots of behind-the-scenes footage on this otherwise monochromatic effort. Sneak Peeks of other Weinstein Company films round out the extras. Unlike may other off-the-wall Best Picture Oscar winners in recent years, The Artist has largely escaped that win's inevitable backlash. There are a few grumbles, sure, but the film's sincerity and faithfulness to the period is sure to win over even those who are averse to silent films. Although its story is almost too elementary, the cheery vitality of Jean Dujardin and Beatrice Bejo (not to mention canine Uggie!) and the interesting extras on the DVD make it a worthwhile buy. Highly Recommended.